This powerful potion is not called anti-bloat for anything! It contains the high fibre cucumber which is known to reduce swelling thanks to a flavonoid antioxidant called quercetin. Mint has anti-bloating merits of its own. Throw together these wonderful and refreshing ingredients to make the anti-bloat juice today. Wash and peel the cucumber as well as ginger. 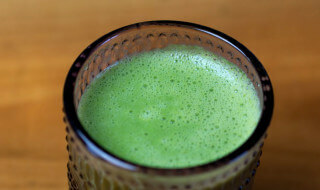 In a blender or juicer, add peeled cucumber, 2-inch piece of ginger, juice of ½ lemon and few mint leaves. Add salt and black pepper for taste and serve without filtering.